22" (559 mm) x 17-7/8" (454 mm) with 7-1/4" (184 mm) overhang. The Kelston collection brings warmth and style to the bathroom. With its elliptical lines and eye-catching curves, this Kelston sink offers a versatile design choice that fits both traditional and contemporary bathrooms. The basin's wide deck provides ample storage. With a generous basin size and an overflow drain to prevent spilled water, Man's Lav is a handsome and practical sink solution. Enameled cast iron construction offers long-lasting performance. Odeon(TM) drop-in bathroom sink with single faucet hole Odeon combines spheres and arcs for sleek, European styling. 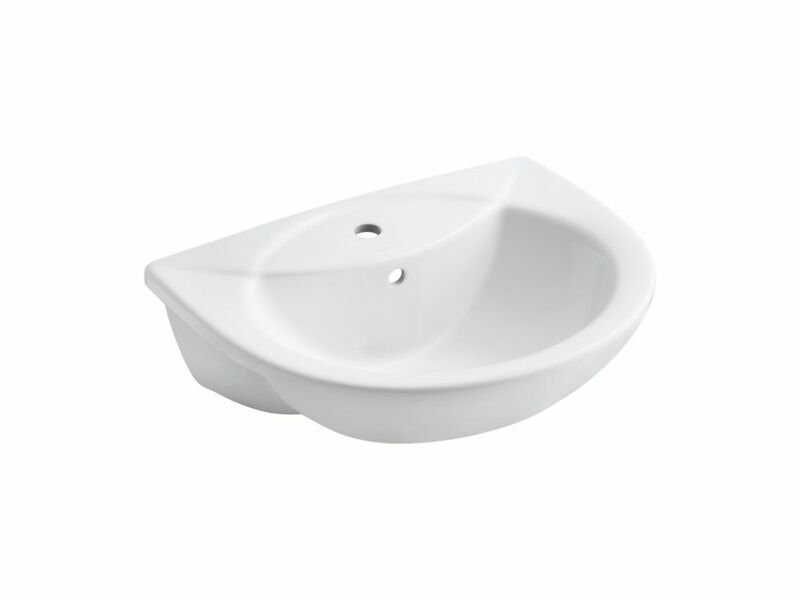 With a compact shape and overflow drain, this sink is ideal for small bathrooms and powder rooms. Odeon(TM) drop-in bathroom sink with single faucet hole is rated 5.0 out of 5 by 1. Rated 5 out of 5 by HandymanWill from I love the beautiful design. With a flush, 'no-overhang' countertop, you will find this install ... I love the beautiful design. With a flush, 'no-overhang' countertop, you will find this install to be a breeze. If you have a front overhang on your countertop, that part of the countertop cutout is tricky. Your cabinet face MUST be designed to accomodate the cutout on the front cabinet face (wood) The cut-out templates are in the box, full size and easy to use. Make special note that you actually fold the template (part for the countertop, part for the cabinet face). ProTip- 1st thing, on the template, use a yellow highlighter to mark the lines you will be cutting.